Most people call it the "terrible-twos" , I call it the "awesome twos". They are starting to develop more independence and they tend to say no a lot. They do develop temper tantrums at this age or even a few months earlier. When you as a parent say no make sure it is a real no. 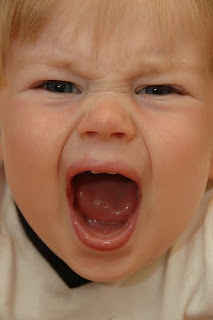 2 year olds are smart and if they know they can get what they want the temper tantrums become longer and more dramatic. They can definitely walk up and down the stairs, socialize, use a fork and spoon. They usually start to dress themselves, they can stack blocks, scribble with crayons. They can start to talk in 2-word phrases and name body parts. They are the awesome twos.